Yellowjackets, meat bees. 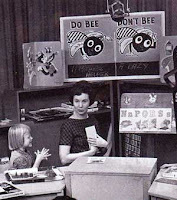 Romper Room Don’t Bees. 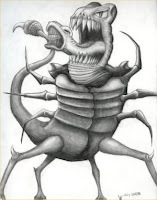 An enormous irritable swarm of apian flesh-eaters. It’s as if they were never living in the garden at all. They’d emerge from a big hole in the short slope between the second and third terrace in our garden, fly somewhere (probably to get coffee at Philz – takes a lot of caffeine to buzz around like that), then return. All day long, yellowjackets streaming out, yellowjackets streaming in. If you’ll recall my August 22nd post, I was contemplating donning a welder’s helmet and poisoning them under cover of night. Or beating them at Chinese checkers and making them buzz off in shame. But I just couldn’t bring myself to become a mass murderer. And I’m not especially good at Chinese checkers; it would’ve been embarrassing to be beaten by the bees. Oh. I almost forgot: I was also mightily scared of them. I was even more frightened after I’d consulted Helen Zverina, the Senior Health Inspector of the Vector Control Program at the San Francisco Department of Public Health. She told me to consult a bee expert, someone who knew what he or she was doing. "Don’t just call an exterminator," she told me. "You’re apt to just make the yellowjackets angry." It was almost as if she could read my mind. Great, I thought. I don’t want the bees to be angry. I want them to be happy. Don’t worry. Bee happy. Maybe I should provide them with better benefits. Perhaps a free cafeteria with raw hamburger and an all-you-can-eat gravy bar. And -- to save wear and tear on their tiny wings -- a shuttle bus with wireless Internet access to take them wherever bees go with their tiny bee laptops and tiny bee iPods. I could gather up their soiled yellowjacket laundry and stuff it in our capacious washer and dryer. Light on the starch, please. Works for a certain company I could mention. In fact, long after said company’s corporate bubble bursts and someone else makes the next big search advance, those guys’ll be running a restaurant service and laundry with free transportation to and fro. Jon and I are certain that’s what they’re doing the best. Better benefits for the bees. That’s the answer. Helen Zverina had me convinced. So I put aside my plan to summon Western Exterminator, no matter how appealing their yellow trucks are. The Western Exterminator man has a mallet behind his back. 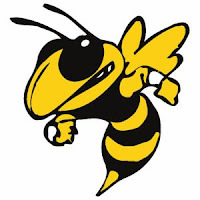 But mallet’s not going to work on a swarm of angry meat bees who don’t have free transportation onto the Peninsula, free shots of wheat grass juice, and free laundry service, right? Time passed. The nest grew. And grew. Around the beginning of October, I contacted Tom Chester, formerly of the SF Beekeepers Association. Formerly? Yes. Formerly. By the time I got around to contacting the fellow that Helen Zverina told me was who she’d call if she had a large nest of angry meat-bees in her front yard, he was gone. He was gone and the bees were flourishing. 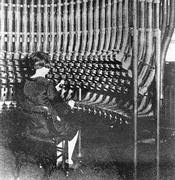 But, through the miracle of the system of pneumatic tubes that we call the Internet, Tom answered the email I sent him. “Best of luck with the wasps. I'd recommend doing nothing for now,” he told me. Just the sort of advice I was hoping for. I live for advice that hinges on doing nothing. Doing nothing is right up my alley. You might say it’s the area of my expertise. I did nothing. All winter. Nothing at all. Nada. Zip. I didn’t even peer into the nest for fear of irritating them. This strategy was a real time-saver, since my previous research established that gardening might disturb the yellowjackets as they went about their day-to-day affairs. Doing whatever it is that easily angered yellowjackets do: Publishing articles in Phys Rev B. Writing C compilers. Eating D-ssert. Sending E-mail to their representatives in Washington. Doing important bee things that I really wouldn’t understand. And now the yellowjackets are gone. Every last bee. I don’t know where they went nor when they left. They broke the lease and split in the dead of night, like the renter a couple of doors down who was moving after midnight, blocking our driveway with his rental van when I was trying to go shopping. The meat bees left very quietly. No buzzing, no loud music on the car stereo, no clunks and thuds of the oak dresser being bumped down the stairs. They left without a trace. I decided to go investigate. In person. Up close. Emboldened by their absense. With my camera, even. Knowing full well that bees hate paparazzi. That’s why they wear those tiny dark glasses. At first I couldn’t even find the nest. The garden out front had become so lush and overgrown that foliage had fully obscured the entry hole. Wildflowers were blooming. Leaves from the miniature banana plant that Evert had given us were scraping a second-floor window (“Oh, that’s not going to be a full-sized tree,” he assured us at adoption time. That Evert. He’ll say anything). Everyone – from D. Meyer to the agapanthus to the papyrus – looked like they had found a mysterious underground wellspring of Schultz’s Plant Food. I took my clippers in hand. Snip. Snip. Snip. What happens if they’re still there? What happens if they’re just being sneaky ol’ meat bees, waiting for me to get close? Snip. Snip. Snap. Snip. Snip. In sixth grade, Mrs. Myrtle Thiess, our sour English and Social Studies teacher, read us a creepy story from Esquire called "Leiningen Versus The Ants." I don’t remember the details, but I believe the story’s main character was eventually devoured by hungry army ants. The clippers sound an awful lot like their powerful ant mandibles echoing in my nightmares. Snip. Snip. Snip. “A successful person always has a neat notebook,” Mrs. Thiess was fond of saying as she held up my own bedraggled notebook as a counterexample. I could tell she thought the inked doodles of Rat Fink on my notebook’s peeling cover foretold a future of prison tattoos, teenaged abortions, and raging drug habits. My feeling was that Mrs. Thiess read us "Leiningen Versus The Ants" to demonstrate the horrible forces of nature that would visit their wrath upon those of us who had messy notebooks. Those of us who let benign neglect take its course. Snip. Snip. Ant mandibles. Snip. Snap. Snip. My briefcase is just like my notebook was in sixth grade. Messy. Focus. I am no longer in sixth grade. Don’t think about Mrs. Thiess. Don’t think about Leiningen. Don’t think about ants. Don’t think about elephants while you’re at it. Say, is that the distant hum of bees I hear underground? I’m not usually afraid of insects, but these yellowjackets intimidate me. But a few more snips reveal a healthy-sized hole in the ground with nary a yellowjacket in sight. The bees are gone. Benign neglect. It worked again. It’s how I run my life. Bee nine neglect. The bees leave. The plants thrive. And my messy notebook has morphed into a messy briefcase. So there, Mrs. Thiess. So there! The problem is, benign neglect only works about half the time. It works for the zit on your chin. For the box of photos in the hall closet. For maintaining most small appliances. But it doesn’t work for everything. I’ve spent the last month or so interviewing people who are trying to keep digital stuff that way. They amass digital stuff. They create digital stuff. They record digital stuff. They stuff it out on servers hither and yon. On YouTube. On Flickr. On Tripod. On Geocities. And as the years roll on, benign neglect takes its toll. Local files are scuttled as computers become obsolete. Most people worry about file formats and disk crashes. Rightly so. But they should also worry about benign neglect. Those 1s and 0s are more like the bees than you’d hope. You go to look for them. And you might find that they’ve scattered. And somewhere she is laughing. My most diligent fact-checker tells me that Leiningen versus the Ants was part of the ninth grade curriculum in the South Bay Union High School District. So perhaps Mrs. Thiess had no hidden agenda w.r.t. insect threats for those of us who had perpetually messy notebooks. On the other hand, if you knew Mrs. Thiess like I knew Mrs. Thiess, you'd suspect the worst. bees here too, and what's up with "the best excuse ever"? (1) Leave those bees alone. (2) Leave that Mrs. Thiess alone. (3) Don't let anyone near you with anything sharp while you're unconscious.